00:50:00 Makes 4 servings, 1 packet (302 g) each. Makes 4 servings, 1 packet (302 g) each. Our foil-pack dinners are a win-win. You get a delicious baked chicken dinner, with next to no clean-up! No mess, no fuss - how's that for a tasty chicken and rice entrée? 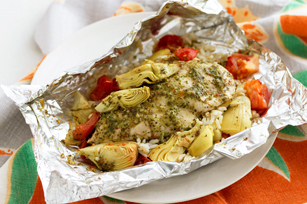 Mix rice and water; spoon onto centres of 4 large sheets heavy-duty foil. Top with chicken, artichokes and tomatoes; drizzle with combined dressing and pesto. Bring up foil sides. Double fold top and both ends to seal each packet, leaving room for heat circulation inside. Place in 15x10x3/4-inch pan. Bake 30 to 35 min. or until chicken is done (170°F). Remove packets from oven; let stand 5 min. Cut slits in foil with sharp knife to release steam before opening. Serving Size Makes 4 servings, 1 packet (302 g) each.